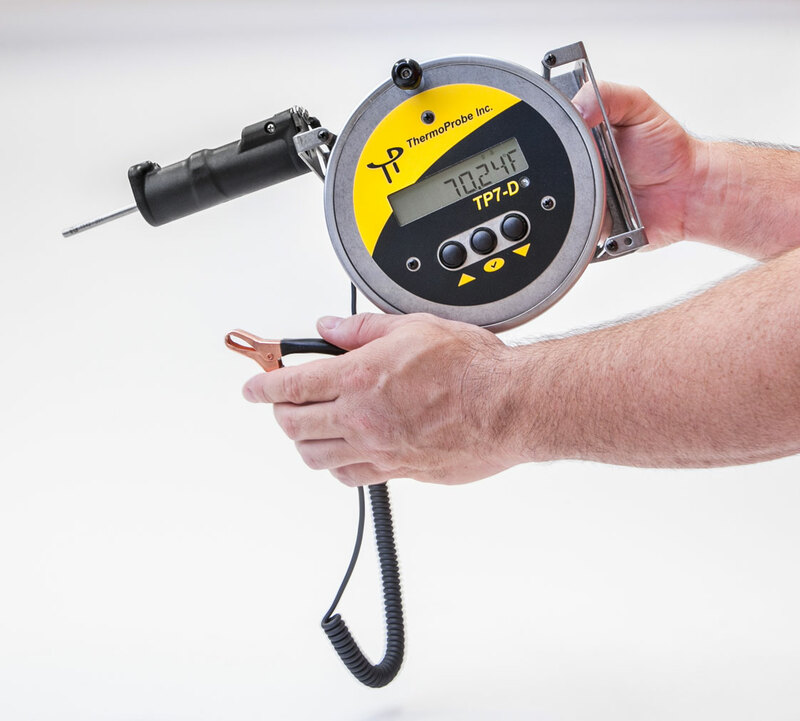 The TP7-D is a Zone 0 intrinsically safe digital gauging thermometer re-designed to the latest standards for use in hazardous locations. With over 30 years experience manufacturing digital thermometers, ThermoProbe has designed the TP7-D with reliable RTD sensors based on our previous industry-standard thermometers such as the TP7-C and TP9. Based on our laboratory thermometer technology, the latest TP7-D electronics are more accurate than previous models. The convenient user interface provides a large 1/2” alpha-numeric character display and buttons that can be easily used with gloves. An automatic backlight feature is included to help read the display in low light conditions. An intuitive menu allows the user to easily select Celsius or Fahrenheit units, display resolution, and access calibration. Icons on the display help the user identify temperature stability, battery condition and menu items. The TP7-D comes equipped with easily replaceable AA batteries, providing up to 200 hours of operation. The TP7-D rugged instrument body is constructed from stainless steel and static-dissipative plastic components. The TP7-D spool-reel design allows the user to quickly deploy and retrieve the sensor probe into various products. With multiple probe configurations and allowable lengths up to 50 meters (165 ft), the TP7-D is well suited to many tank gauging applications. The probe assembly is constructed of easy to clean materials such as non-stick cable and stainless steel. New units are supplied with a NIST traceable, ISO/IEC 17025 Accredited report of calibration Free of charge! TP-7D-075-SW-SM ThermoProbe TP7-D, -40/400 °F, 0.01 Div. 75′ cable length, Standard Weight, Standard Markers. TP-7D-075-EW-SM ThermoProbe TP7-D, -40/400 °F, 0.01 Div. 75′ cable length, Extra Weight, Standard Markers. TP-7D-075-AW-SM ThermoProbe TP7-D, -40/400 °F, 0.01 Div. 75′ cable length, Asphalt Weight, Standard Markers. TP-7D-25M-EW-MM ThermoProbe TP7-D, -40/400 °F, 0.01 Div. 25 Meter cable length, Extra Weight, Metric Markers. TP-7D-25M-SW-MM ThermoProbe TP7-D, -40/400 °F, 0.01 Div. 25 Meter cable length, Standard Weight, Metric Markers.